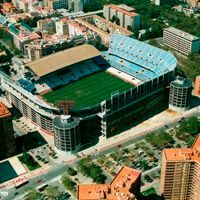 First Europa League group game for Swansea City is the Valencia away fixture at Mestalla, one of the most steep stadiums, built upwards due to high density of residential buildings around it. The away contingent can be up to 2,377 and is likely to use all the allocated tickets. However, Swansea City warns its supporters that the away section is on top of the stadium and getting there may be associated with some health risks..
“It is worth noting that in order to access your seat you will have to climb 19 flights of stairs – which equates to 152 steps,” says the website. “There is no lift access to the area where Swans fans will be situated. “Also, disabled supporters are advised to contact Valencia directly if they wish to purchase tickets. This is because the disabled section is at the opposite end of the stadium to where the Swans fans will be housed. “With the away section situated very high up in the upper tier, we would like to inform supporters to monitor their situation if they suffer from vertigo or other height fears.